This page has all the posts related to our deli. In here you can find out about what's going on in the deli, what products we're stocking or other stuff that might be interesting. We also post news about special offers and discounts in here, so it's always worth checking back! 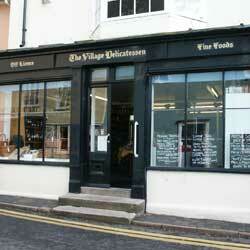 You can find out more about our deli on the About Us page. This year we’re trying something a little different. Along with our usual stock of Christmas Puddings and Christmas Cakes (and the stock is running down as we speak, so don’t delay! ), we’re going to be baking our special homemade Mince Pies to order. Boxes of 6 will be £3.00. Buy 12 or more and the price drops to £2.80 per box. As you can see from the pictures, they’re a little smaller than the usual store-bought variety, but they’re much nicer. Give us a few days notice, let us know which day you want them and we’ll have them ready, freshly baked for that day. Closed Christmas Day, Boxing Day, the 27th, and the 28th. The Café will be open as usual until Sunday 20th December, which will be our last day open this year. Both the Deli and the Café will reopen on the 14th January. This is where we promise to start posting more frequent updates to the website to keep you entertained, and well, we will try but to be honest we spend so much time running the place we struggle with our “media presence”. We’re always here if you need us! Anyway, you can find a link to download the Christmas order forms at the end of this post. If you don’t fancy downloading them and printing them out, you can have a look to use as a guide and just email us your order. Or simply drop into the shop as we have a pile of them waiting for you. The deadline this year is SUNDAY 13th DECEMBER. It’s a little early because of how Christmas Day falls, but these are the requirements of our suppliers. Orders taken after this date we can usually fill but it is on a first-come, first-served basis so we can’t guarantee anything. We’ve put them out a month early so even the less organised have time! Do be aware however that our baker, De’Ath’s, have decided they don’t want to work between Christmas and New Year, so although we’ll be open we won’t have our usual selection of breads available. Please bear this in mind if you need to order extra to freeze. The Rabbit Bakery will be doing a small bake on New Year’s Eve, so there will be some bread on that day. All that’s left is to wish you a Merry Run Up To Christmas! Don’t get too stressed! Nobody likes to think about Christmas too early, but we’ve had the order forms in the shop for a little over a week now and someone suggested I make them available online too, which is a good idea. Unfortunately, Christmas falls on a Thursday this year, which is Bad News™ for small retailers as our orders have to be with our suppliers almost a week earlier than usual. We have included the ‘Order By’ dates on the forms as well. Please bear in mind that we will do our absolute best to fulfil orders placed after these dates, but we can’t guarantee anything! Sorry! Our order form is quite straightforward. We haven’t included a tick sheet of things you might like as the range available from our fresh suppliers would mean we are handing out actual booklets or brochures. The butcher (Primrose Pork) provides Pork and Beef as you’d like and expect a butcher to provide it, and even a range of Lamb. The bakers includes both De’Ath’s (our daily bread) and The Rabbit Bakery (our Saturday speciality bread) and they supply their usual range. The dairy is Marybelle, so higher quality and more local than nearby supermarket offerings, and they supply milk, creams, yoghurts, and even creme fraiche. Click here to download a pdf of our order sheet. Okay, well, it’s Christmas 2014 and we’ve gone a whole year without putting any updates on the website. I suppose that’s the downside of spending all your time actually running the place – no time for self promotion! Then the café is closed until the 13th of January, reopening on the 14th. Then we are closed from 31st December until 14th January. We are closed from Monday 23rd December until January 14th. It’s that time of year again. It hasn’t exactly crept up on us – it never does these days – but still the little tasks get away from you. Well, we’re almost fully stocked for that final run up to the year’s biggest day of doing nothing with the family. Stocked up in preparation for the end of the world? No!? Best get down here then! We still have order forms available to guarantee your fresh stuff (meat, cheese, bread, etc.) but our guarantee cut-off is Monday 16th for the forms, so it’s really a last-hurrah for them over the weekend. We’ll still try and get anything ordered after that but it’s less certain you’ll get exactly what you need after that. Sorry! Also, be aware, Our ‘World Famous’ (they’ve been posted to every corner of the globe!) Christmas Puddings are running out fast! Get ’em while you can! It’s not all HURRY, HURRY, HURRY though. Good news is, Adnams have finally released the first of their Whisky! It’s beautiful, much anticipated, ever-so-slightly expensive, and LIMITED EDITION. Okay, so it is a little bit of HURRY, but they’ll make an excellent gift for the Whisky-lovers, so don’t miss out. Merry Christmas to you all, and we hope you have a very greedy Christmas! Katie has begun with the usual salads: potato salad, tabouleh, rice salad, lentil & carrot salad, and a few others. Available to take away in the shop, or as part of your lunch in the café. On the good days you can even sit out in our quiet little courtyard garden, a nice safe spot away from the bustle of the, er, village.